The amount of food your cat needs will vary depending on breed, activity level, age and climate. 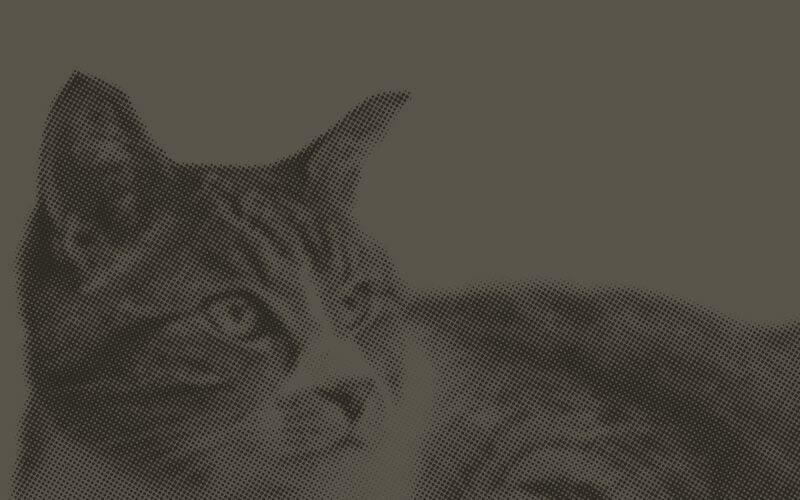 Use our feeding chart as a guide, adjusting the quantity fed to achieve your cat’s ideal weight. We suggest feeding twice a day, kittens more often. Provide fresh, clean water at all times. Love, attention, playtime and chin scratches should be given freely, as often as possible. 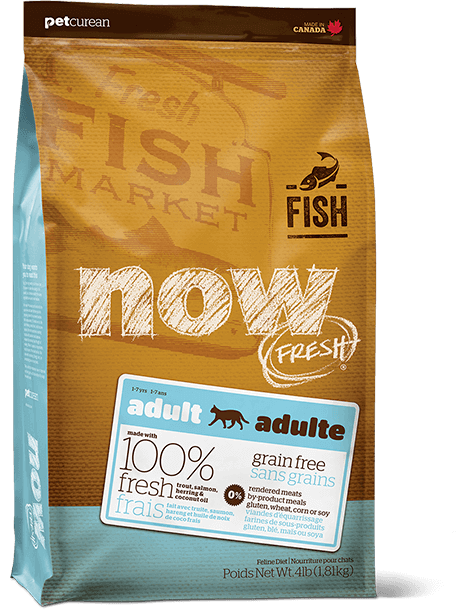 NOW FRESH™ grain free Kitten recipe is formulated to meet the nutritional levels established by the AAFCO Cat Food Nutrient Profiles for Growth. My kitten loves this food and the recommended amount seems to be filling enough for him! 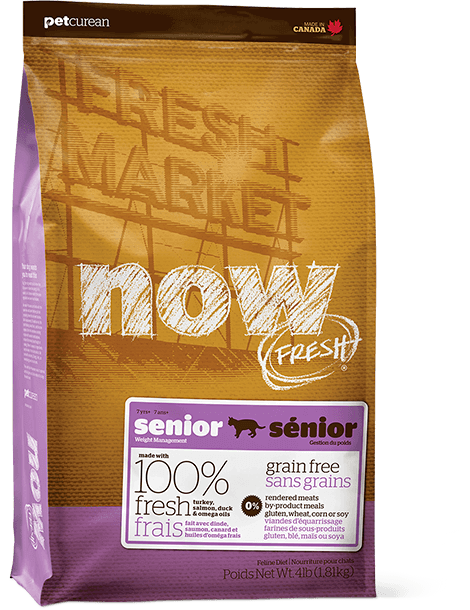 His old food gave him stinky kitten toots but after switching to Now Fresh that little problem has gone away! I will be starting him on the adult food soon, I’m so pleased with this food!! Our kitten was allergic to everything, we tried many different kinds of food and had horrible results. This was the only food we found that didn't make her sick! And because the ingredients are so good, a bag goes a long way. Our local pet store recommended this to us, and we couldn't be happier. We have 4 personal cats under a year (as well as 2 seniors) and foster 1-2 more at any given time; all of our young cats are in love with this food and are doing well with it. I only wish the kitten came in the 16 lb bag as well to cut down on packaging waste. When I brought my first bag of this home my kittens could barely wait until I had opened the bag and just about inhaled it out of the bowl. They love this food! Their coats are soft and shiny, their teeth are strong, they're active and quick-witted, perfect weights, and have no issues with vomiting, diarrhea, etc. I can't recommend it strongly enough. One possible issue is that one of them became a bit gassy, but since I started mixing this with another (also petcurean) cat food, that seems to have improved. Unfortunately my kitten wouldn't touch the stuff. I mixed it together with his current food, and he picked around it entirely. I don't know if it's because it's got potatoes high on the list, or if it was just a smell he didn't like, but he wanted no part in it. He adored the Go! Fit+Free food though! I am giving it two stars because it's not a bad budget cat food, if your cat likes it. Hi Emily! 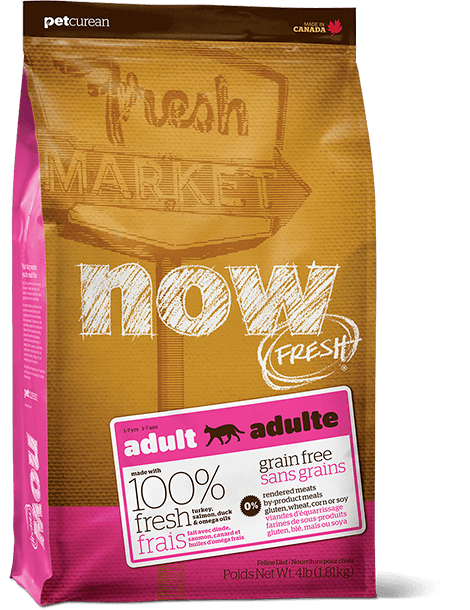 Thanks for your review of NOW FRESH Grain Free Kitten. It's not uncommon for pets, especially cats to refuse to eat a new food. With the very complex olfactory senses subtle differences in fresh ingredient smells from what they are used to can affect palatability. However, we are glad that you found the FIT + FREE works! If you have any further questions or need more information please give us a call at 1.866.864.6112. 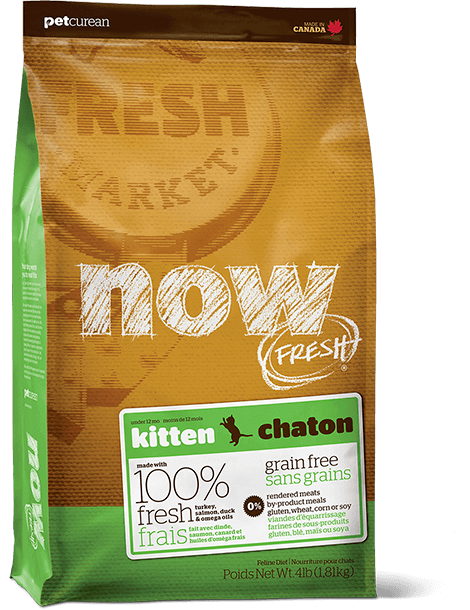 I tried Now Fresh Grain Free Kitten Food for my kitten through a free sample from PetCurean's website and we were hooked. Our kitty loves the food. Her coat is soft and shiny, she is the perfect weight and she has an abundance of energy all of the time. Her teeth are nice and clean too which is important to their overall health.